IntelliQuilter Training Videos: Modern pantos - example Troubled Seas from Its a Quilt Thing. Modern pantos - example Troubled Seas from Its a Quilt Thing. This was originally written to one puzzled iQ owner but I think it might help many who are having problems with this type of pantograph pattern. Troubled Seas, from It's a Quilt Thing, isn’t like an ordinary panto so it can’t be set up as a pantograph pattern. There are several patterns for sale right now like this and to know which are unusual, read the description of the pattern. They’ll usually state that they are long - Troubled Seas say it's says 120” long in the description on It's a Quilt Thing web site. That’s the clue as to how to set them up. With these patterns, it’s beneficial to set up and save a complete quilt that’s large. These steps will show you how to do that and then at the end, i’ll describe how to use the master saved quilt. You can do this with your tablet in demo mode off the machine, if you prefer. Follow these steps starting at the main menu. 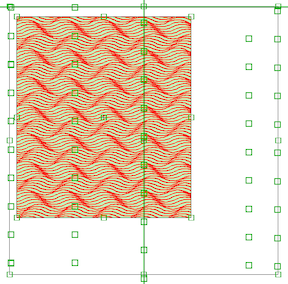 Block pattern > enter rectangle manually > width 120”, enter, height 120”, enter, continue > finished. Look at the image - if the pattern isn’t horizontal, rotate it until it is. Since this pattern is 120” wide and your block is 120” wide, it should fit at the designed scale. Look at the pattern - make sure the S and E are at the left hand end and that the S is at the top and the E at the bottom. Rotate the pattern or flip it to get this image. Now move it to the top of the block. 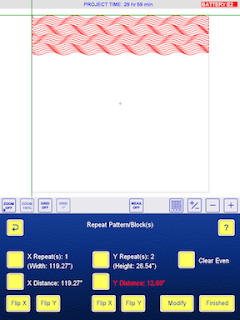 Touch Y repeats, then touch the plus sign. Mine looked like this. The gap between the rows needs to be closed so touch Y distance, then tap the minus sign until the bottom row has snugged up against the top row to your liking. Touch Y repeats again and tap the plus sign until the block is filled. I went to 10 repeats. They slightly overlap the block but that doesn’t matter. Finished > Finished > Save Quilt/Pattern > Save the quilt > Give the quilt a name (perhaps Troubled Seas). Put it in a quilt catalog, perhaps a new one named Master Quilts, or pantos, or something that makes sense to you. Now I’ll describe how to use this master quilt. Back out to the main menu. Design/Sew Quilt > Edit/sew Existing > Select the saved troubled seas master, continue. If I was working on a quilt and had it loaded, at this point I’d touch the top, center reference point and move my needle to that point on the quilt. If you’re doing this in demo mode, it doesn’t matter where you touch the image. The next button to touch is Add/Edit Block > add block > clipping block. Touch the button that says select all, continue. Now you’ll see something like this. 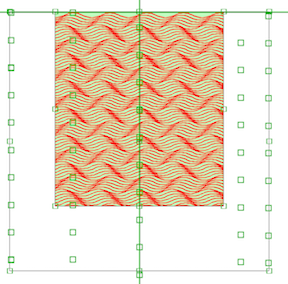 Touch the move button and move the clipping block around until you like how the pattern looks. I did this. Now you must choose the transition that will happen at the edge of the quilt where the pattern is clipped off. I usually choose continuous for edge to edge patterns because that stitching will be either right at the edge or off the edge of the quilt. At that point I touched sew quilt and my machine started to move to the start point of the first row BUT i hadn’t yet aligned my quilt with where I set the clipped block so I touched pause, then touched realign and followed the steps to align my image with my quilt. If you can’t see any of the quilt in the image, touch zoom, then zoom full so you can do the alignment. 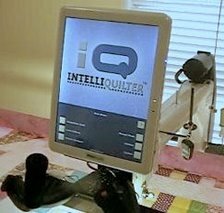 As soon as you’ve aligned the image with the quilt, iQ will move to the start of the first row and the quilting will begin. This pattern does stitch each row back and forth. I know my machine is picky about stitching right to left so I need to see if it will stitch nicely or not. 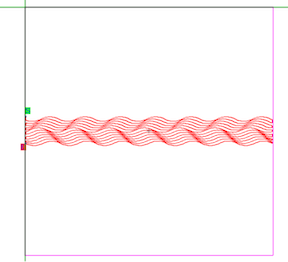 If I find my thread breaking on the right to left lines, I’ll have to split each line and make them all stitch left to right. That’s another lesson if you find your machine can’t stitch right to left without breaking the thread. Rember, the clue to this type of edge to edge or panto pattern is to read the pattern's description at the vendors web site. 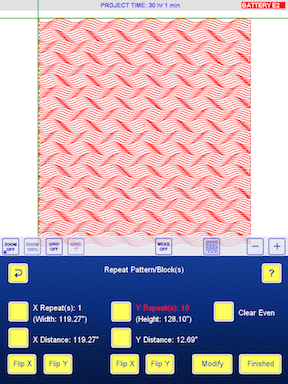 If it's a long pattern, it cannot be set up as a panto but must be set up as a repeated block pattern. The video showing setting up a Meadowlyon pictogram is a very similar method.